–Laugh at work to reduce stress? It’s not that hard to relate it to higher productivity. We can all remember a time the Aha! moment came freely and easily, after doing something FUN. –Healthier employees mean healthier bottom lines. –“Once you start laughing, it forces you to feel better,” said Dr. Steinbaum, a spokeswoman for the American Heart Association’s Go Red For Women movement. –It’s impact is shown to last at least 24 hours, she said. That’s a good reason to laugh every day. –Some research indicates people with heart disease are 40 percent less likely to laugh than people without it. –People are naturally drawn to those who are happy and up-beat as they exude positivity, which draws others towards them. These are 10 real-world tested ideas (from clients who are using them) to make people laugh and smile. 4. Bring balloons to work for any occasion you want: Landed a New Client Day. Made Our Numbers Day. Put the Project to Bed Day. Guaranteed smiles. 6. Silly Hat Day. Pajama Day. Weird Hair Day. Spontaneously announce these and have prizes for the top 3 who take it to heart. 7. Around the World Lunch. Everyone brings a favorite dish from a different country to a potluck lunch. (requires some organizing.) The fun factor increases if you ask contributors to dress like someone from that country while serving your dish. 8. April Fools! Encourage people to post their favorite April Fools trick on a bulletin board. 9. Ice Cream Day. Have managers bring in an ice cream cart and pass around to people. Extra fun: Buy an inexpensive jingle so you sound like the ice cream truck coming through the neighborhood. 10. Meeting Free Day. Announce on Monday, one day that week which will be free of all meetings. Stick to it. People will be grinning from ear to ear! 11. Smile as you walk through the office. Doing this is 100% CONTAGIOUS in spreading a positive mood. The power of making smiles and laughter part of your culture is not hard to “get.” It will make it easier to solve problems, deal with difficulty, and lower the stress factor of your employees. 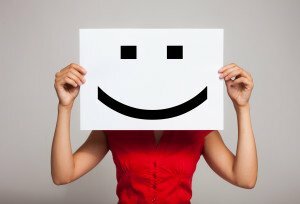 What are your favorite “Smile and Laugh More At Work” tips?